A friend of mine mentioned Carter Beats the Devil when we were discussing recent movies about magicians (Now you see me, The Prestige etc.). He wondered whether or not there might be a movie about it, since he found it "cinematic". Well, turns out there might be a movie version. There definitely should be one. 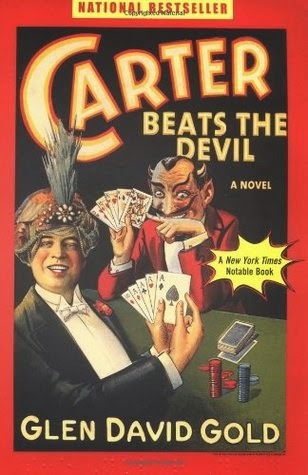 Carter Beats the Devil is an entertaining read with a huge amount of detail, depth and heart. Charles Carter, a real historical person, is deployed here in a fictionalized version of his life, from young boy to grown man. There are elements of a typical bildungsroman as well as a strong current of change-of-the-century wonder. The world evolves wonderfully around Carter, as he travels the world, first in the bowels of a travelling circus and later as the headliner of his own show. There are setbacks and lucky circumstances, love and loss, all of which is deftly handled by Gold. The fiction here is so close to the actual history that it is sometimes hard to tell which parts are pulled from an encyclopedia and which parts are conjured up by the writer. Americans might be more familiar with the relevant history, but I had a hard time figuring out if Warren Harding had actually been murdered or if he was a president of the United States in the first place. Also, the book is rife with celebrity cameos (as I can imagine the movie will be), but most of these slipped my attention. Am I supposed to know that the Marx Brothers performed as "Fun in Hi Skule" at one point of their career? Maybe not, but a little complementary knowledge won't hurt future readers. The attention to detail is amazing, though, as is the way Gold is able to "show, not tell" his way around tricky character interactions and subplots. The narration is subtle and rewarding, the character arcs realistic and thoughtful. Despite all the magic and sleight-of-hand, I did not feel cheated in any way, even when some plot twists initially seemed absurd. As with some previous books mentioned here, my only problem was the drawn out conclusion. The finale appeared to be written with only one thing in mind - a transition to the big screen. It doesn't serve the narrative well and takes too much of the readers time describing the twists and turns of... well I won't tell. But, this is a minor gripe, since I was genuinely glad I read Carter beats the devil. In my mind, though, it might make a better television series - à la Sherlock - than a single two hour movie. The exquisite characters and the wonderful attention to historical detail are what drives this literally wonderful novel.